Each softgel of CuraPro™ contains 750 mg of a proprietary blend consisting of Curcumin CRX 791 Micronized (Curcuma longa) Rhizome Extract, phospholipids, turmeric essential oils. Other ingredients: Medium chain tryglycerides, gelatin, glycerin, high phosphatidylcholine, lecithin, purified water, yellow beeswax. Contains Soy. "This proprietary complex provides enhanced bioavailability and sustained retention time in the body, using patent-pending technology. Equivalent to 7,500 mg of Curcumin 95%. Up to 1000% Greater Absorption. 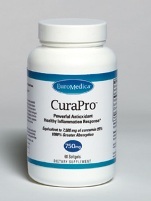 A patent-pending method using small particle size, turmeric essential oil, and phospholipids ensures that CuraPro® delivers a curcumin that is up to 10 times more bioavailable than curcumin 95%, and 6.3 times more bioavailable than curcumin with lecithin and piperine, as well has having an 8-12 hour retention time in the body. The result is a high-potency formula providing superior support for the body’s natural anti- inflammatory response, a healthy immune and cardiovascular system, and resistance to free radical activity." Take 1 softgel daily, up to 3 softgels daily may be taken. A favorite herb of the Bulgarians. This amazing compound has a multiplicity of uses and is non-toxic and non-irritating when diluted as directed. Vitamin U for the stomach. The better kind of Cat's Claw. All the plant for maximum benefits.